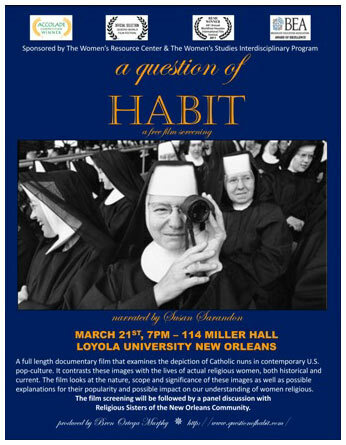 Catholic nuns from the New Orleans area will converge at Loyola University New Orleans to share what their lives are really like during a free film screening event featuring “A Question of Habit,” a documentary contrasting the Catholic nuns represented in contemporary U.S. pop culture and the lives of actual religious sisters. The film screening, open to the public, is set for March 21 at 7 p.m. in Miller Hall, room 114 on Loyola’s main campus. The film, narrated by Susan Sarandon, will be followed by a panel discussion with film producer Bren Ortega Murphy and the Religious Sisters of the New Orleans Community. The film examines how pop culture impacts our understanding of religious women. The event is sponsored by the Women’s Resource Center and The Women’s Studies interdisciplinary program. For more information, contact Sister Terri Bednarz at 504-865-3943.